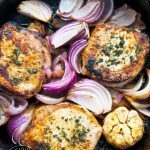 These Clean Eating Roasted Garlic And Onion Pork Chops are a low carb, higher fat meal for those who follow a clean eating, low carb path. My mom loves pork. She asks for it all the time. So I find myself having to come up with new ways to keep “the other white meat” interesting. Mini Chef loves pork as well, so he never argues when I make it, and I’m happy to serve a dinner that nobody complains about. This one is pretty quick and easy. It’ll take you about 30 minutes to prepare if you are quick with the onions and garlic. It’s convenient because you finish cooking it in the oven (you don’t have to, but it’s extra time to prepare other foods). So if you are making rice or veggies to go with this, the time in the oven gives you time to focus on any side dishes you might serve with this. I paired this with artichokes and added some brown rice for Mini Chef and my mom. It was a satisfying dinner for all and I got to rest easy because everyone was happy. That’s a big deal these days! With three of us now, there always seems to be something that somebody doesn’t like. So pork seems to be my “happy place” in the dinner department. That and taco salad. I never get any arguments or complaints with that one either. Note: I realize some of you believe that pork is not clean. I personally consider it to be clean and that is my personal choice. If pork doesn’t fit your belief system or eating plan, I have lots of non-pork recipes you can enjoy! These delicious pork chops are a wonderful way to enjoy pork. Just don't talk to anybody the next day because that garlic is yummy too! Sprinkle both sides of the pork chops equally with the sage and garlic powder. Using 1 tbsp. 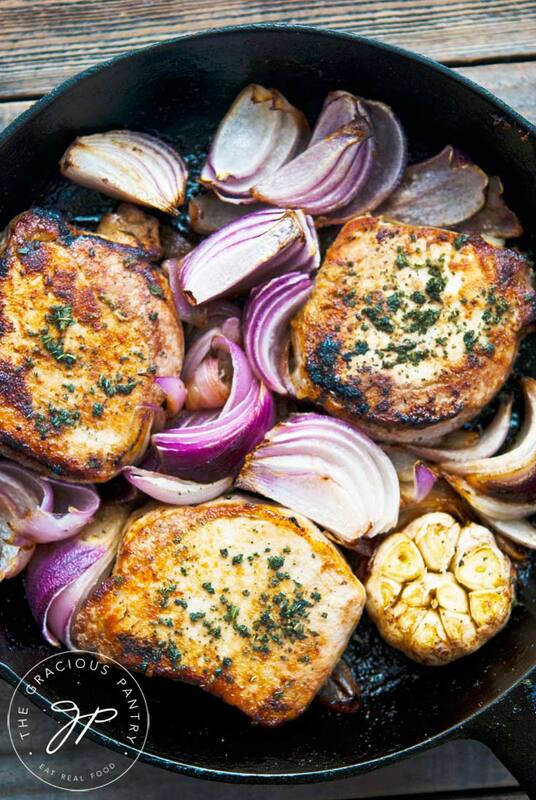 of oil, brown the pork chops in an oven-safe skillet. Chop the top of the garlic head off to expose all of the cloves. Set aside. Place the onion pieces in a bowl or zipper top plastic bag and combine with 2 tbsp. oil. Shake to coat the onions. When the chops are browned, place the head of garlic in the pan as well as the onions. If needed, add a 4th tbsp of oil to the skillet (only if the pan is really dry). Place the entire pan in the oven and bake for approximately 20 minutes or until the pork reaches at least 165 F.
Remove from oven and cool enough to handle the garlic. Squeeze out the cloves and serve. Recipe from the Gracious Pantry archives, originally posted 5/17/15.